Think coffee and you probably imagine a simple, black cup of joe, a mellow cafe au lait or the incessantly long lines at Starbucks to get your triple venti soy no-foam latte. For many, coffee has become a integral component to start the day, catch up with friends or take a casual business meeting. The origin of this ubiquitous beverage has been fiercely debated with stories of its birthplace ranging from the foothills of Latin America to a goat shepherd named Kaldi who noticed his goats behaved rather strangely after eating a mysterious fruit in Ethiopia. While the most popular story of origin seems to be Kaldi&apos;s first brewed cup of coffee in Ethiopia, the earliest cultivation came from a city you probably know very little about. In fact, coffee comes from the highland areas of the southern tip of the Red Sea in port Al-Mokha (also spelled Mocha) in Yemen where locals gave it the Arabic name qahwa, the word from which coffee and cafe are derived. "Coffee was everything for Yemen," said Sheikh Shabbir Ezzi, a Yemeni businessman at Al Ezzi Industries. "It&apos;s a gift from our ancestors. You can see how important coffee was for Yemen from the emblem of the country. Inside the bird&apos;s heart is a coffee plant." Considered the "Wine of Arabia," coffee drinking first appeared in the Sufi monasteries of Yemen in the 15th century where Arab Sufi monks adopted coffee as a drink that would allow them to more easily stay awake for midnight prayers. Soon enough the beverage slipped into everyday use and evolved into a lucrative trade item that spread throughout the Islamic world and sprouted clusters of kaveh kanes or coffee houses in Persia, Egypt, Turkey, Syria and North Africa. These coffee houses became centers of intellectual life where men would meet together to talk, listen to and discuss poetry, share their opinions on the issues of the day or play games like chess and backgammon. 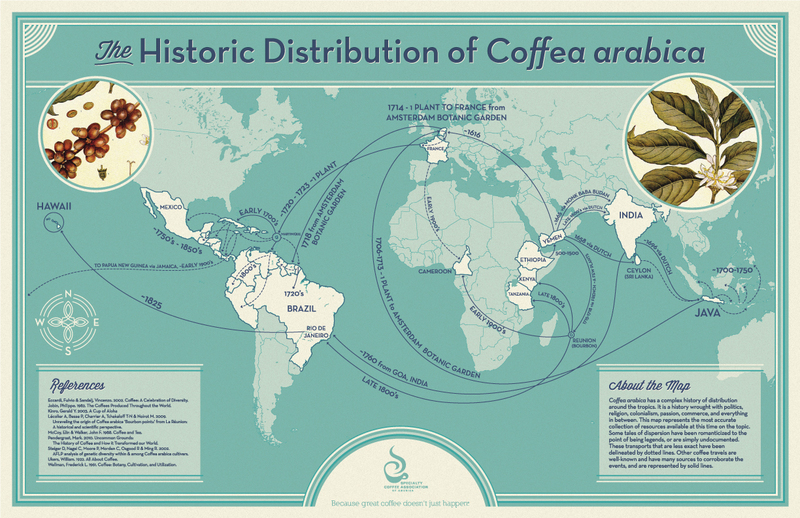 Coffee then spread to Europe through the Ottoman Empire, as well as by sea from the Yemeni port of Mocha. The English and Dutch East India Companies, who were major purchasers at Mocha in the 17th century, managed to transport the Mocha beans and trees back to Europe, India, Sumatra, Bali and other islands in the East Indies. In The Joy of Coffee, Corby Kummer explains that the word mocha "became associated with chocolate because Europeans&apos; first experiences with cocoa, in the 17th century, reminded them of the bittersweet coffee they imported from Yemen." "It is very provincial ... a treasure from the earth," said Jim Reynolds, a coffee buyer and taster at Peet&apos;s Coffee & Tea in Berkeley, Calif. "Rich, full-bodied, green, nutty, woody, yet inconsistent and unpredictable. Very pronounced tastes: fruity, chocolatey, winey, exotic and complex. Subtleties of flavor are often on a subconscious level — not quite there, if you know what I mean. As in a good friendship, a bit of mystery remains, and this is what makes Yemeni coffee so great." The delicious Arabica coffee bean also takes a long time to cultivate and perfect. According to 60-year-old Yemeni coffee cultivator Mohammed al-Maisi, the beans used to make the coffee can only be harvested five years after being planted at 2,500 meters (about 8,202 feet above sea level) and must be picked by hand after changing from green to red in a careful, labor-intensive process. "I usually prefer to pick them myself, because if done incorrectly one can damange the stem or even the tree," said Maisi. After harvesting, the cherries are cleaned and sun-dried for up to four weeks until finally the last layers of dry skin are removed. Yemenis also traditionally use every aspect of the coffee plant. While the beans are used to make traditional coffee called Bun, the husk is also used to make another coffee drink called qishr, spiced with cardamom and ginger, which is filled with antioxidants. The leaves are also used to make a red-tea-like herbal medicine. While the unique identity and flavor of the original Mocha coffee bean did not translate to plantations overseas, the culture of coffee itself translated into coffeehouses or cafés throughout continental Europe that soon became egalitarian meeting places in the 17th century, filled with rich discussions, companionship and delicious food. Image Credit: Wikimedia Commons. 17th century café in England. According to coffee historian Ian Bersten, the brewing styles also evolved from country to country in part due to genetics. While many Europeans took to taking coffee with milk, Mediterranean people including Arabs, Greek Cypriots and southern Italians took their coffee straight and often well-sweetened because they tended to be lactose-intolerant. "From the two ends of Europe," writes Bersten, "There eventually developed two totally different ways to brew this new commodity — either filtered in Northern Europe or espresso style in Southern Europe. The intolerance to milk may have even caused cappuccinos to be smaller in Italy so that milk intolerance problems could be minimized." While global coffee production has declined in Yemen, there are still attempts to revive cultivation to its former trading glory. As the famous song by Ayoub Tarish goes, "Yemeni coffee, oh pearl, oh treasure above the tree; Whoever grows you, will never be poor or humiliated."